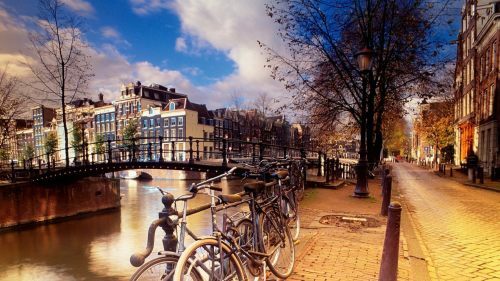 Icelandair has dropped the price of their late winter and early spring flights from Edmonton to Amsterdam, Netherlands down to $496 CAD roundtrip including taxes. 2 free checked bags are included. 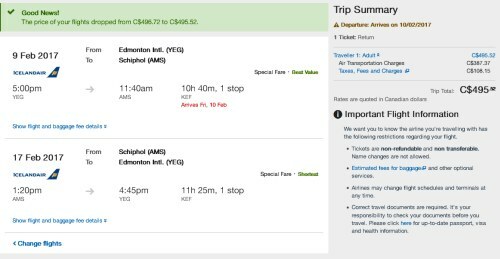 You can also fly from Edmonton to Paris, and then Amsterdam to Edmonton - for just $482 CAD including taxes. The furthest away you can depart is March 31, returning on a variety of dates in April. Click on the departure date box to open up the calendar view and look for the date combinations that are $497 roundtrip. Note that you can also start by clicking on the dates that are $515. 1. Try looking for a normal roundtrip flight using the Google Flights links from above. 2. Write down the departure and return dates of the cheap flight you found on Google Flights. - Change the departure and return dates to the ones you found in Step 2. 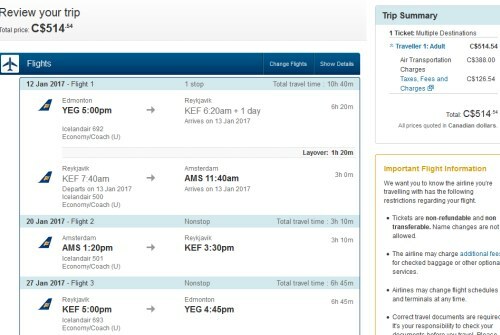 - For the middle flight, you can try playing around with the date, to spend more or less time in Amsterdam vs Iceland. 4. Select your flights, and click through to the Expedia website for booking. You can also find Icelandair flights to Munich or Frankfurt, Germany for $520 to $548 CAD roundtrip including taxes around similar dates (Nov 2016 to March 2017). Click on the departure date box to open up the calendar view and look for the cheap date combinations. 2. Go to Momondo or Skyscanner and search for a flight from Edmonton to Munich or Frankfurt. 3. Click through from Momondo or Skyscanner to the booking site showing the cheap price. 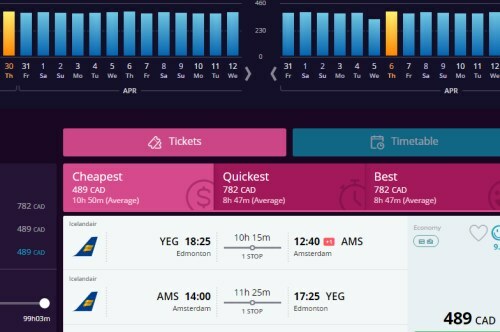 You can also fly from Edmonton to Paris, and then from Amsterdam to Edmonton - for just $482 CAD including taxes. Scroll down towards the bottom of this blog post for details. Apr 5, 6, 10, 11, 14 -- new! Update 12/3 - There is now a late March departure available again, with return flights on a variety of April dates. The dates have been added to the list directly above. edmonton, yeg, flight deals, europe, western europe, amsterdam, ams, netherlands, central europe, icelandair, frankfurt, germany, fra, munich and muc. 2 Responses to "Edmonton to Amsterdam, Netherlands - $496 CAD roundtrip including taxes"
I've been dealing with Chris since 2010 when we went to New York. He's always had great deals!! Nice! Thanks for checking it out after all these years!